For the price, you're getting the bare minimum when it comes to true wireless 'buds. But considering the competition is way more expensive, these aren't a bad bang your buck option. The wireless revolution keeps on keeping on with a slew of new truly wireless earbuds. Today we’re looking at the Jam Ultra a sleek looking pair of headphones that even got a red dot award for design, but how do they fare in actual usage? Let’s find out. In the box you’ll get the headphones, the charging case, some extra ear tips, the instruction booklet, and the warranty information. First thing you’ll notice when you take the headphones out of the charging case is that the same fabric that lines the outside of the case also line the outside of the earbuds. That might lead you to think these aren’t sweatproof but you’d be wrong. They are protected against sweat though I can’t imagine that the fabric will stay clean once you start sweating into them. Right in the middle of each earbud is the only button you’ll get. This multifunction button controls everything from playback to pairing and power, so get familiar with the right amount of clicks and long presses to do what you need it to do. Though it works, I found it to be a little sensitive and I ended up accidentally pausing music while just trying to adjust the way they sit in my ears. Design-wise these are definitely a lot nicer than some other options available and they’re also smaller too. They still kind of stick out from your ears when you’re wearing them but they’re a little more flush to the ears than other pairs I’ve tried like the Jabra Elite Sport. Of course these don’t have all of the features that the Jabra’s do, but I think that’s a good thing. Jam didn’t try to do too much with these they just focused on making an affordable, true wireless option to listen to music and I think they’ve succeeded there. Although these look nice, the biggest issue I keep running into is fit. They’re somewhat uncomfortable to use and after taking them off my ears thank me. I also couldn’t get a secure enough fit that I was confident enough in to go for a run. They haven’t really fallen out but I’ve caught them dangling more than a few times while just doing something as mundane as walking around my apartment. They do come with a few different ear tip options so I was able to find one that fit a little better but still wasn’t confidence inspiring, hopefully your luck will be different maybe I just have weird ears. As a pair of Bluetooth earbuds with no wires whatsoever, connection is more important than ever and I’ve had a mixed bag of results with the Jam Ultra. Let’s start with the negative which is the pairing process. It’s quite literally my job to try out as many headphones as I can get my grubby little paws on, so I consider myself pretty knowledgeable when it comes to how to pair devices to other devices. But I still had trouble pairing these initially. For the longest only the left ‘bud would connect and the right one would stay silent, or vice versa. Eventually I figured it out. All I had to do was turn off both earbuds, then turn them on again and pair to only the right one. After that I had to turn them both off again and put them back in the case. Finally they would connect after taking them out of the case. Yeah, it was as annoying as it sounds. But now for the good stuff, because after that nightmare I found that these have an amazing connection. Not once did I have a dropped signal in all my testing. It didn’t matter which pocket my phone was in. The only time they skipped was when I began testing the range. I got to about 25 feet with a wall in the way before skipping became a problem. So assuming you can get them to pair to your device easily, you shouldn’t have a problem with music skipping which is super important if you’re going to be using these for exercise. As far as playback controls go these are very limited, almost as much as the Apple Airpods. One click on either button will pause/play music or answer phone calls, while a quick double tap on either ‘bud will activate Siri or the Google Assistant. These are also the buttons you have to hold down if you want to turn them on or off. If you want to skip between songs or adjust the volume you’re going to have to pull out your smartphone which can be very inconvenient when exercising. In our testing we got just under 3 hours of constant playback which is more or less what Jam claimed. If you run out of juice you’ll have to throw these back in the case which can provide an additional 10 charges. Not bad at all. Unfortunately there’s no quick charging feature here so if you forget to charge them you’ll be out of luck for a while. The case also has a USB out so you can provide a last second charge to your smartphone if you need to. If you’re expecting great sound, I’m sorry to disappoint you. The quality on these sounds like how Bluetooth sounded two or three years ago (not good). The lows sound boomy and completely overtake the lower mids making everything sound pretty muddy. You can really hear this in the song “Kanye” by Bogan Via where the rolling drums throughout really take over. Even the hi-hat that plays throughout seems to be lower in volume as most of the attention is given to those rolling drums. Vocals and instruments like guitars that live in the mids are also kind of fuzzy and fall flat. In the song “I’m Yours” Jason Mraz sounds like he’s coming to you from behind a thin piece of film and the guitar strokes don’t have the same squeaky clean feel to them that I’m used to. Of course they sound good enough for exercise, but you’re probably going to want to carry around an extra set of headphones for when you want to really hear the details in your favorite songs. The Jam Ultra charging case is large and coated in the same fabric as the earbuds, making it easy to grip despite its size. The Jam Ultra earbuds feature one button to control playback. If you want to adjust volume, you’ll have to reach for your phone. The Jam Ultra true wireless earbuds can be had for $75, making these the best bang for your buck. The Jam Ultra charging case provides an extra 10 charging cycles, but the standalone battery is three hours. Plus, there’s no quick-charge feature. 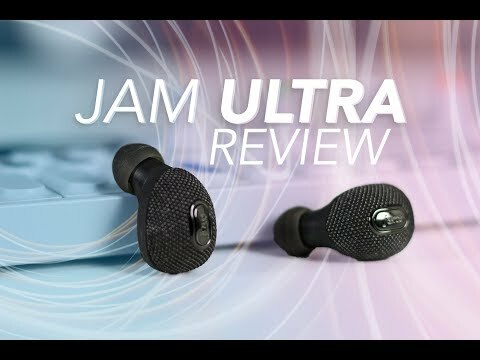 There’s plenty of improvements that can be made to the Jam Ultra’s, but considering they only cost $99 it’s pretty impressive how good these are. At this price point, you’d have to expect a drop in sound quality even in regular headphones so considering these are truly wireless it’s impressive how decent they are actually are. Sure the initial pairing process was a hassle so we have to dock a few points for, but after that problem the connection was flawless and actually really impressive. The only pair of true wireless ‘buds I’ve used that were better were the Airpods. Even with its downsides I have no problem recommending these as a bang for your buck option if you want to try out the truly wireless life. No wires, no restrictions. With JAM Transit Ultra, you're free to move. Two separate earbuds fit snugly and comfortably into each ear, delivering up to 3 hours of playtime with a single charge. When you're done rocking, pop them back into their charging and carrying case for up to 10 full earbud charges. you'll love that the case doubles as a backup battery for your mobile devices- just plug them into the USB port. Features Bluetooth 4.1 and wireless calling capability.